Threatened according to the IUCN Global Red List,but there are no restrictions for exports.There are three pairs of barbells. Laterally brownish yellow and has 15 broad,dark brown vertical bands on the sides and are slightly displaced along the lateral line. 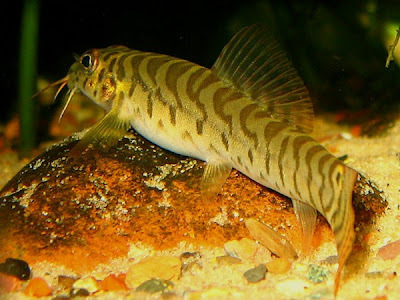 There is a white-bordered,dark ocellus on the caudal peduncle.About 4cm in size.Found in shaded or unshaded shallow slow flowing waters with pebbled substrate. They are recorded in the South-Western lowlands,up to an elevation of 300m and included under the South-Western ichthyofaunal province.